Eliana Miranda, MPH, is a certified health and wellness coach, lifestyle medicine coach, yoga teacher and energy worker. Her study of health began at a young age when she was diagnosed with a chronic auto-immune disease, and has since devoted her life to understanding the dynamic relationship between the mind, body and soul. By immersing herself in various avenues of healing, she cultivates a practice that ebbs and flows with the cyclical patterns of our modern day life. She has come to understand that optimal well-being is achieved by working with the many different aspects of being human, and isn’t subject to simply being free of disease. 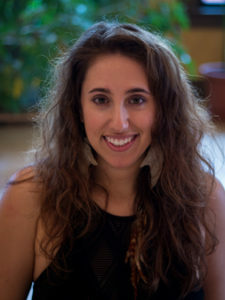 With a master’s degree in health promotion and behavioral sciences, an in-depth study of ancient Ayurvedic lifestyle treatments, and an unwavering devotion to teach, learn, and connect with others, Eliana is committed to empowering her clients to be their best selves so they can live their very best lives. Eliana offers Multidimensional Wellness Sessions: weaving her practice and study with the client’s own goals to create a unique experience that supports their future. To feel better in the body: have more energy, feel lighter, or simply come into relation with their physical frame. To feel freer in the mind: experiencing true happiness, passion, and zest for life. To understand the greater picture. To define questions, understand why’s, and come into awareness of the greater purpose. If it is one of these things, or all of these things, this work can help to connect the dots. In person appointments on Mondays. Virtual appointments available Tuesday- Friday. Thank each and every one of you for your participation and dedication to the evolution of your being through mindful presence, thoughtful inquiry, and embodied exploration. It takes courage to delve into the depths of your internal landscape, and even more courage to acknowledge what you discover. January’s Touch of Sound explored the capacity that we have for courage, and the importance of aligning your heart center before taking the initiatory steps towards your goals. We focused our curiosity on the Gallbladder meridian, getting in touch with the yang energy stirring underneath the Earth’s surface following the winter solstice- Nature’s energy rising. Such hopefulness can come from the returning of the light. Clear perspective coming forth from our eyes, the ability to truly listen with our hearts to the wisdom within, the deep breath of courage that expands from our rib cage- all building our ability to initiate movement from our core, through our hips, down to our feet, taking the first step toward our chosen path. What are you moving closer to this year? February 1st, Touch of Sound continues our exploration with the Liver meridian. The wisdom within the Liver meridian teaches us how to persevere through any obstacles in our path, including our own mental game, and continue moving forward toward our goals. The Liver meridian is more about the long-term investment of your energy and the ability to carry out your goals through time, whereas the Gallbladder we spoke of this month speaks the story of initiating movement. If you are wanting to connect more deeply with the ability to think strategically, maintain a plan, and take control of your forward trajectory- please, come join us for Touch of Sound on February 1st! Let’s strengthen our ability to stay strong in the face of diversity, and rise up together! Liver medicine can also help to strengthen our detoxification pathways of our physical bodies in addition to old patterns no longer serving our highest selves. Women have the beautiful opportunity to shed these physical and energetic patterns with their menstrual cycles each month- also governed by the Liver! Come explore with us! Touch of Sound is a collaboration of Ryan McLaughlin, L.Ac. and percussionist Benjammin Lee. Following the art and wisdom of Chinese Cosmology, we invite you to join us for an embodied exploration of the Chinese Medicine organ networks- through acupuncture, percussive sound journey, meditation, song, and movement. We are thrilled to be offering you the opportunity to dive deep with exploration of your inner landscape- the first Friday of every monththroughout 2019! Gifting yourself the space to deepen your relationship with yourself- one organ at a time. Each month a different organ system and acupuncture channel will be featured, felt, and loved. Acupuncture in this healing circle will provide opportunity to attune to the present moment through harnessing the stories and wisdom held within the acupuncture channels. Ryan McLaughlin, L.Ac. will craft a unique treatment for you using pulse diagnosis to inform and open the doorway into supporting your unique constitution align with the energy of the moment. The room will be filled with the sweet vibrations of Benjammin Lee– an active percussionist in the Portland music scene- as we journey into the exploration within. Discounted packages available for those that wish to pre-register for multiple sessions. Check out the the link above for more details! E-mail: ryan@flourishoflifemedicine.com with any questions, or to purchase a Touch of Sound discount package! Please arrive between 7-7:15pm in comfortable clothing. (*doors will be locked at 7:15pm*). 7:00-7:15 Arrival, Intake forms completed, Create your nest & settling in. 7:15-7:30 Opening of Healing Circle: movement, meditation, and teachings. optional sharing of observations or questions. Discounts on Individual Sessions Ryan McLaughlin, L.Ac. are available to all Touch of Sound Community Members! Let’s dive deeper together!